While there was a great deal of activity before, during and after the July 22, 2015 meeting of the Chicago Board of Education (the last to be chaired by David Vitale, who is being replaced as President of the Board), one of the most striking things about the meeting was that Chicago political leaders and aldermen are making it clear that they oppose the expansion of the city's charter schools. And among those who spoke out at the Board's meeting against charters was one, 12th Ward Alderman George Cardenas, who had as late as two years ago supported charter expansion in his own ward. 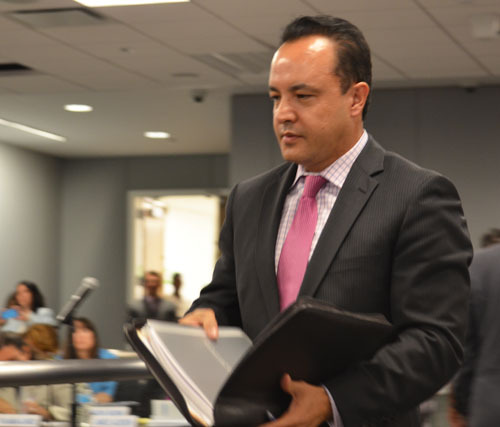 Twelfth Ward Alderman George Cardenas was one of those who spoke against charter expansion at the July 22, 2015 meeting of the Chicago Board of Education. Noteworthy about Cardenas's position was that it comes less than two years after he faced protests in his ward about his support for charter expansion there. Cardenas's change reflects a growing movement to freeze Chicago's charter expansion and to do a more thorough investigation of the actual practices of the city's charter schools. Substance photo by Sharon Schmidt.As usual, charter supporters delivered their litanies in praise of the charters. Again, charter supporters had jammed the sign-in for "Public Participation", thereby limiting the number of people who could come before the Board (and media) speaking on the issues facing the nation's third largest school system and the 300,000 children (including two of this reporter) who attend those public schools. At least 32 of the 60 speakers who were able to sign in to speak at the meeting were from charter schools, a cursory review of the official listing of those signed up for "Public Participation" shows. The ability of the Board of Education to choke off the number of speakers by forcing sign-in by computer and stopping the computer count at 60 was again evident. (This reporter signed in a precisely 8:00 on July 13, 2015, when the sign-in began, and by 8:05 the Board had locked out additional speakers; I did speak. Officially, the Board was having sign-ins until 5:00 p.m. on July 17, but that was, in the eyes of many careful observers, a joke on the public and on democracy). To hear the charter speakers at the Board, usually reading from their carefully prepared scripts, an uninformed observers would believe that a child was doomed to physical and educational failure -- or worse -- had he or she been forced to attend the local public schools. But since the scripts never identify the "bad" public school that is being slandered by the speakers, it has long been impossible for defenders of public education to challenge the myths of the charter proponents. And once again, on July 22, 2015, not one member of the Chicago Board of Education demanded facts from the charter proponents (some of whom had trouble reading the prepared remarks they had been provided by the charter operators they were defending). Corruption at the charters have also been completely ignored by the Board members for years, even as in some cases that corruption might lead to later scandals such as those which finally engulfed clergy in churches where such problems had also been covered up by higher authority. Perhaps the most shocking presentation at the July 22, 2015 Chicago Board of Education meeting was a Power Point that showed that Chicago's charter schools are kicking out a huge number of students, as critics have long charged and the city's real public schools (which take in those who are kicked out of the charters) have long documented. Only 66 students were expelled from the city's real public schools during the 2014 - 2015 school year (out of 343,983 students), CPS data now show. But the charters kicked out 300 students out of only 52,700 students in those charters. 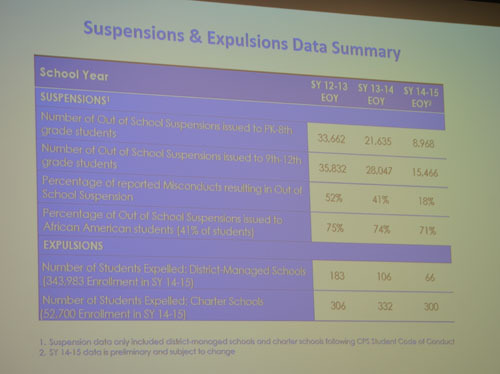 The charter numbers presented to the Board do not show all charter expulsions, because they were only based on charter schools that utilize the CPS Student Code of Conduct and many charters are allowed to utilize their own codes of conduct. Substance graphic is a photo of the Power Point slide shown at the July 22, 2015 Board meeting. Photo by Sharon Schmidt.But the Board did receive a report that demonstrated clearly one aspect of the corruption of Chicago's ever expanding charter schools: Chicago charters are kicking kids out at a rate more than 20 times the rate of expulsions from the city's real public schools. A Power Point report provided to the Board as part of its consideration of the latest version of the "Student Code of Conduct" showed that fact, which has long been proved by the city's regular public schools and documented by the Chicago Teachers Union, Substance, and other researchers. A full report on the Board meeting will be published later in Substance.